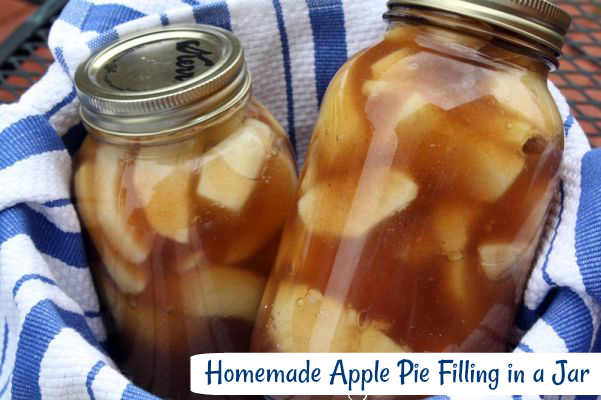 DIY Home Canned Apple Pie Filling in a Jar. These are perfect to have on hand during apple season or when you crave an apple pie, crisp or cobbler. A couple weeks back I had mentioned on Facebook that I found a steal of a deal on apples at my local Kroger. Anytime I'm in Kroger, I always make a point to stop by the reduced produce bins just to see what they have. Some days there isn't anything and some days you hit the jackpot like with these apples. Most folks don't like the reduced section, but I love it!! You can stumble upon some awesome unexpected bargains. I think most people just don't know what to do with all those ripe fruits and veggies. A few may have some bumps and bruises on them, but they're still fine to use. Folks just don't realize how much of it you can freeze or transform into something new. I always keep a eye out for oranges, cuties, zucchini, yellow squash, green peppers, bananas and apples. For bananas you can chunk them up and freeze them for smoothies or banana bread. Squash and zucchini can be shredded and frozen for zucchini bread or muffins. Green bell peppers are always so pricey that when I see them in the clearance bin I jump on it so I can make Stuffed Peppers. And apples well the possibilities are endless you can freeze them or you can take them home and transform them into homemade applesauce, apple butter, apple pie jam or apple pie Filling. I was so excited to snag 2 bags of apple for $1.59 each! The wheels in my head were just spinning on what I could make with them. I was going back in forth from applesauce, apple pie to apple butter. It was just so hard to decide. Then it hit me apple pie fillin!!!! I've been wanting to try my hand at canning some Homemade Apple Pie Filling. I had asked some of my face book fans what I should make and apple butter seemed to be the the favorite, but I just couldn't get that apple pie filling out of my head. So that was the recipe I settled on. I couldn't believe how many recipes there were online for canned apple pie filling. They all looked the same and had similar ingredients, so I just picked one. I have to say the whole process went a lot smoother than I thought and the hardest part was peeling all those apples. I've come to realize that I'm investing in one of those nifty apple peelers. Especially since we want to go apple picking this fall. If you have an apple peeler please let me know which you prefer a suction cup base or the ones that clamp onto the counter, because I'm not sure which one to purchase, so any help would be appreciated. Back to the Apple Pie Filling!!! This recipe was a cinch to make and not time consuming at all. Just imagine being able to bake apple pies in a snap all year long with ready made canned filling!!!! You can also use this apple pie filling to make apple cobbler, apple crisp, apple flautas, or use it as a side dish for breakfast. I have so much fun canning to me its actually relaxing. Here are the apples. I didn't have the full 6 pounds of apples so I cut the recipe in half and it turned out perfectly. To start in a large pot, blend together sugar, clear jel, cinnamon, nutmeg and salt. Stir in the water and lemon juice and mix with a wire whisk. While the filling was cooking I sliced the apples and added them into a solution of 3 tablespoons of lemon juice to 1 quart of water to avoid discoloration. Drain the fruit well before packing in jars. Pack apples into clean, hot canning jars leaving an inch from the top of the jar. Fill with the hot syrup, leaving 1/2 inch space from the top of the jar. Remove air bubbles by running a knife around the insides of each jar. Close the jars with sterile lids and rims. Process quart size jars in a boiling water bath for 30 minutes. Place the jars on a dish towel to dry and allow the jars to cool for several hours or overnight. Check the seals to make certain the lids are sealed properly. The pie filling will be dark in color until it has cooled down. When completely cooled the color of the filling will lighten up. Enjoy!!! 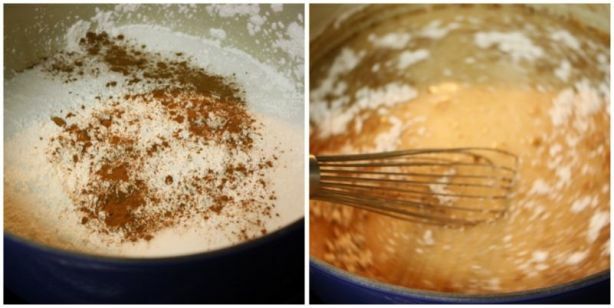 In a large pot, blend together sugar, clear gel, cinnamon, nutmeg and salt. Stir in the 10 cups of water or (5 cups water & 5 cups apple juice) and lemon juice with a wire whisk. Cook and stir until bubbly and thick; remove from heat. While the filling is cooking peel and slice the apples. Add apples to a solution of 3 tablespoons of lemon juice to 1 quart of water to avoid discoloration while you peel all the apples. Drain the fruit well before packing in jars. 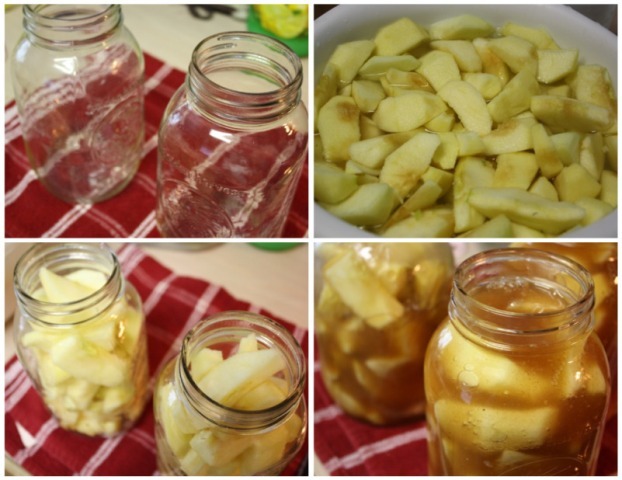 Pack apples into clean, hot canning jars leaving an inch from the top of the jar. Fill with the hot syrup, leaving 1/2 inch space from the top of the jar. Remove air bubbles by running a knife around the insides of each jar. Close the jars with sterile lids and rims. Process in a boiling water bath for 20 -30 minutes Use a jar tongs to remove the jars from water Place the jars on a dish towel to dry and allow the jars to cool for several hours. Recipe Yields: 3 quart size jars and one pint size. Cook's Note: Clear Jel is a modified food starch that is used as a thickening agent in canning recipes. It is most commonly used in home canned apple pie filling, but can also be used in other pie fillings, other preserves, home canned soups, etc. For canning, you want to use regular Clear - Jel (not Instant) each is clearly marked. Instant Clear - Jel thickens food without heat and does not work well with canning, because it breaks down when being heated for long periods of time. Just stumbled across your blog, and I gotta say, your apple pie filling looks just yummy!!! I never would have thought to can homemade pie filling! I also love the canning process. This past Christmas I made Gingered Pear Preserves as gifts for my family. YUM. I also love to can. My favorite thing is fresh fruit jam. I've made strawberry-cranberry, strawberry, sweet cherry, peach, blueberry-lime...the possibilities are awesome! My kids love apples and they are going to like this. That is for sure! I can't wait to make some. We've doing doing this in my family for a long time. It's great for cobbler too! That looks so good--and easy. Some day I will get over my fear of canning!! Hi Kylee I was so surprised when someone emailed me and told me about Tk. I love Ree and feel so honored that she thought one of my recipes was good enough to feature. I have a pampered chef apple peeler/corer/slicer and I love it. makes the apple job so much easier. Mine does not have the suction cup but does have a wooden stand so I don't have to attach it to my cabinets. Thank You for entering the Bake Up Summer Sweets Contest. I hope you are given the opportunity to own a new KitchenAid mixer so you can whip up both your strawberry kool-aid Pie and the strawberry soda pop cake recipe with ease. Your apple pie filling looks wonderful! I love to can, too, and am also super excited to find a basket of apples, peaches, just about anything that I can play with. Last year a friend of my moms had gobs of extra Concord grapes, so she gave me five large bags full -- about 50 pounds -- and I made lots and lots of grape juice. Yum, we have been enjoying it all year. 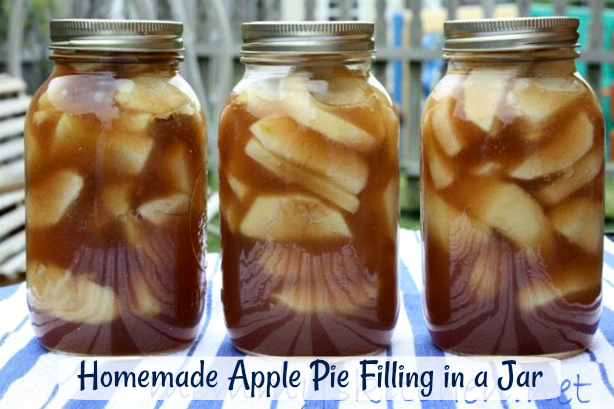 In fact, I think I'll go pour me some right now :) Thanks for sharing this apple pie filling post; that's something I've never made but I think next fall when the apples around here are ripe, I will. Tina, what a wonderful recipe. I must admit that I've never canned anything but have always wanted to. I'm a fan of anything apple, especially apple pie so I will be trying this recipe of yours. Thanks. I have canned some over the years... I have never done Apple Pie Filling.. I canned yours... It looked just like your picture of it whenit was done.. So glad I found your blog! I have been searching for a good recipe for weeks and yours sounded like it would work best. I just canned 6 quarts of this apple pie filling today and it was super easy! We made your apple pie filling last night. My apples shrunk so much that the bottom 1/3 of the jar is just filling! The jars were really packed before I added the filling liquid. Do you have any suggestions? It looks beautiful, though and I am looking forward to using it. Thanks! How long would this stay good for after canned? If canned properly they will last in you pantry for one year. Hi - this looks so yummy! I think my favorite apple pie though is made with honey (I hate honey). It's not over sweet because you use 1/2 the honey you do sugar and it kind of has a different taste. It's wonderful. I sent the recipe to a friend of mine, maybe I'll have her can up a few for me. Apple Pie filling..... ......this may help you... In your canning quart jar: 1/2 quart of water in microwave till boiling...Add all ingredients except apples...stir...repeat a couple of times until you think it is ready to add apples...rid air bubbles with knife around sides...somewhat a slow process...but...works ! This recipe made 3 quart size jars and one pint size. I used the smaller one to make apple dumplings. Hi there, I have Clear Jel. Can I use that insted of the cornstarch? And, if so, is it the same quantity? Thank you! This looks amazing. I loved this recipe. It was so nice to pull a bottle out of the pantry and throw it into a pie crust. Viola! I tried something similar with apricots. Its okay . . . but can't rave over it like the apple. Any chance you will experiment with apricot pie filling? Just a quick comment about apple peelers. I've tried both kinds--the suction cup and the clamp. They both work really well if you have the perfect apple--perfect shape, perfect hardness. However, if the apple is a bit soft or isn't perfectly round, then forget it. The apple gets stuck and falls off and makes a horrible mess. It's much easier to just do it by hand. I currently have the Pampered Chef clamp kind and I'll probably never use it again. Sorry for the discouraging comment, but don't waste your money. One word for the apple pie filling: A. MAZE. ING. I was on a very strict diet when I made this, so I didn't get to taste one teeny bit. Now that I'm done with the diet, I made a few turnovers with the filling. I used store bought canned biscuits. We all LOVED it!!!! This is the BEST pie filling I have ever had / made!!!!! I made this very same recipe, found online before I 'met' your blog! I was home from work, not feeling well, but by 3PM, I was feeling better and needed a 'pick-me-up'.. nothing does it like 'cooking'! LOL The recipe was so easy.. cornstarch, water, sugar, cinnamon, cloves.. EASY!! I used the abundance of 'pears' from our tree out front. I had already peeled and cored and didn't want them to go to waste. This was the perfect solution! I have used one of the jars to make a delicious pear pie! The rest I will give as Christmas Gifts! I hope they like it as much as I did. I WILL do it again. Going to try it with the apples I have now! Can't wait. just made this with some peaches i got at the farmers market. love it. but after i packed the peaches in the jars i have a lot of filling left. going to save it and hopefully i can find some apples on sale. we are also going to try it tomorrow on buck wheat pancakes as syrup. great recipe. How long does the apple pie filling stay good to use??? I have never canned anything and am new at it so was just wondering! Properly home canned items are good up to one year after canning. I am so excited that I decided to try this apple pie filling. The recipe is SO amazing! I can't stop canning this. I started around Halloween and today I made 6 more quarts! I am going to give some away for Christmas presents, when the process is complete the jar of filling is so pretty. Whoever gets this present from me will be very, very lucky as I want to keep it all to myself! This is the best! A quick note to answer your question about apple peelers...I have two but still peel by hand. The first is my grandmother's old Rival Peel-O-Matic that clamps to the table and works ok but not great (I think new blades would help if I could get them). I bought a Pampered Chef Peeler, that also clamps to the table, thinking that it would be better. It's not! If you don't have the perfect shaped apple, or you're using drops, or a softer variety, it skips places and gums up. I end up having to "clean up" the apple with a paring knife anyway so it's just as quick and easy to peel by hand. That's not to say there aren't better ones out there, but I'm 0 for 2, so I'm sticking with a paring knife and apple corer/wedger. I have made this 2 times now and each time I have made a double batch! It is awsome and so easy! I use it for apple pies and apple crisp and upside down apple cake and oh I have to hide it so my husband dosen't just eat a jar of it! the only change I have made is I add a bit more cornstarch to it when I put it into a pie crust before baking! Extra cinnamon also sometimes!LOve it thankyou for sharing this! No need to peel the apples if they are organic. The peels have a great texture after processing. You should use Clear-jel, not cornstarch for thickening, according to USDA. Use the same amounts as cornstarch. Home canned goods will last several years, but are best quality if used within one year. I hate seeing people throw out perfectly good food just because somebody told them it is only good for one year. If the lids are still sealed and there is no sign of spoilage, it is still safe to use after 1, 2, or more years. Some things may darken but that is not a sign of spoilage. Anything processed in either a BWB or pressure canner for more than 5 min. does not need sterilized jars. Try blackberry-plum...way better than either one alone! I thought I'd ask for help--trouble shooting ideas--I made this filling from apples we picked this year apple picking, followed the recipe/instructions to the letter save one substitution--I didn't have corn starch so I substituted tapioca starch, which cooks thesaurus recommended for pie fillings. I used quart jars, and all but one of them overflowed! I left the head space you suggested, but I think something must happen, like tapioca starch must have more expanding capability or something, because I took the lid off the canner to see my beautifully prepared jars spewing filling into the water like a leaky radiator! I was afraid to take them out actually,afraid they might literally explode. So bummed! I guess I'll be making a lot of pies, or freezing this filling. Help! Suction peeler is great. Won't damage counter as clamp might. Doesn't slip. Whats the lifespan on the canned Apple Pie filling? I would say about 3-6 months when properly canned. I try to avoid using refined sugar where possible. Do you think this recipe would work and be safe to can using 100% pure maple syrup or honey, instead of sugar? Just made this tonight. It waws very good. i also used nutmeg and cloves, and bit of extra cinnamon as that's the way I like my apple pies. Thank you so much for posting this. To think I was going to make applesauce! Jeesh! this is to @Anonymous #46 commenter: "I KNOW!! TRY plum & Peaches, plum raspberry, plum & Blueberry, plum strawberry, (plum w/lime & fresh grated ginger root is to die for) and then I made one mixing in of all of the above combos, even the ginger lime! Then do the same thing with peach jam...SO Awesome!! I don't think I can ever eat just plain single fruit jam anymore! In fact, I know I can't! I am so glad you have the recipe for canned apple pie, thank you so much. A neighbor of ours gave us a bunch of three different kinds of apples and I was just running out of things to do with them. So once again, thank you. Great apple crop this year so will try this recipe. Re: peeling apples: push the apple onto a drill bit and hold the peeler while the drill turns the apple. Saw a video of an actual chef peeling his apples in this manner. I made this recipe and mine turned into a gel after sitting for a couple days. Is it supposed to do that? I'm afraid to use them because I'm afraid they've gone bad. That is just the filling thickening up. As sugar cools from cooking it thickens up. think you can use honey instead of sugar? 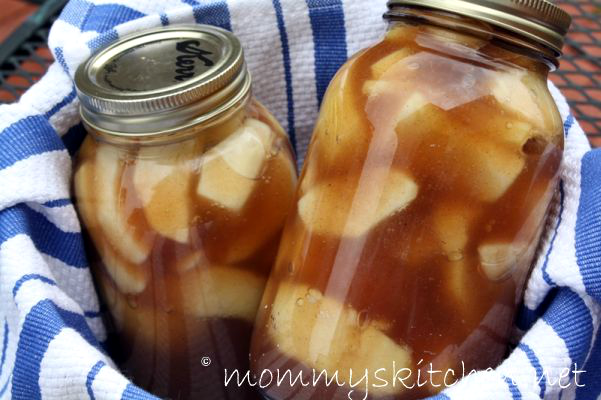 Ive tried this recipe and everytime I am done processing my apples turn to mush in the jar. Any suggestions? I stumbled across your blog by searching for the baking time for my own home-canned apple pie filling. I only use Clear Gel, which the Ball book recommends. I bought 5# online last summer and will be using it for a couple more years, I'm sure! Your recipe looks similar - an tasty, too! By this time, I'm sure you've already purchased an apple peeler/corer/slicer. I have used both the suction cup type and the clamp, and I prefer the clamp...often, the suction cup loses its grip! I used to clamp my peeler in the dishwasher opening (with the door open), so all the extra juice would drip into the dishwasher and not on the floor. THEN I bought a cute little stand for it from Pampered Chef, and Viola! I wash the entire thing when I'm done and it fits nicely on a shelf, too. Thanks for the info! So I made this and the last batch is processing now. I got twice as much as the recipe yields. Not sure if I ruined it? I am wondering if I didn't cook the sauce long enough. I did double the batch. I am seeing that this recipe calls for clear gel. I could not find it anywhere (Small Town I guess) What would the equivalent cornstarch be? Cornstarch is not recommended for canning homemade apple pie filling. If you are unable to find certo or ball pectin than you can use cornstarch or flour, but you will need to freeze the pie filling in gallon size zip lock bags.